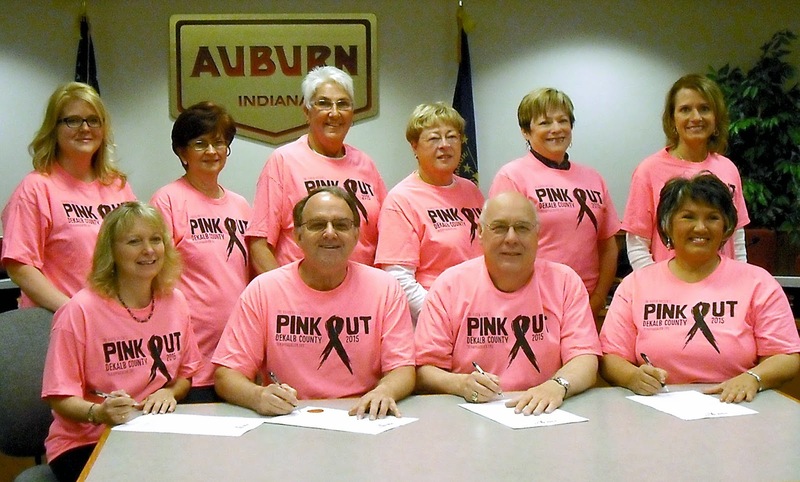 Monday, April 27, 2015, three mayors and a town manager declared May as Pink Out DeKalb County month in their respective communities. On hand for the proclamation were: first row: (L-R) Tena Woenker, Town Manager, city of Waterloo, Norm Yoder, Mayor of the city of Auburn; Ron Walter, Mayor of the city of Butler; and Tonya Hoeffel, Mayor of the city of Garrett. In the second row: Melissa Eshbach, Tri Kappa of Auburn, Francine's Friends board member and secretary Glynda Harris; Francine's Friend's board member and vice president Judy Springer; Francine's Friends board member and president Sharon Simmons; Francine's Friend's board member and treasurer MaryAnn Ziembo; and Shelley Smaltz, Tri Kappa Auburn (photo courtesy of Melissa Eshbach). Official Tri Kappa Presents "Pink Out DeKalb County" events include a Pre-Event - Zumbathon, on Saturday, May 2, with pre-registration from 5-6 pm and the Zumbathon event from 6-10pm at the Auburn YMCA. Thursday, May 21 - Tri Kappa Presents "Pink Out DeKalb County 2015" in Auburn! All proceeds to benefit Francine's Friends Mobile Mammography. Special thanks to Melissa Eshbach, Shelley Smaltz, and Natalie Taylor-DeWitt, of Tri Kappa of Auburn, for doing such a wonderful job of organizing this first-time event!